This morning at home we were talking about the warm season and the accompanying bushfires and my son asked: “mum, if our house was on fire and you could only grab one thing on your way out what would it be?” Without hesitation I said “my marathon shirt of course!” The kids went for their tablets and my husband for his guitar. My answer got me pondering how I’ve grew so attached to a piece of athletic apparel with no commercial value. Is it really more precious than my new notebook that carries gigabytes of my life? I guess it is, and my answer reveals a lot about my values and stage in life. The items in my list of most treasured material possessions have changed considerable overtime. I remember that as a child I would rescue my oldest dolly from the flames in a blink and in my adolescence my extensive stationery collection would not be left to burn. In my early twenties I was very fond of my cassette tapes (yes, I’m that old!) – I could not go a day without them. When I moved to Australia, my passport topped the list and later for a while my computer or laptop were the top priority. 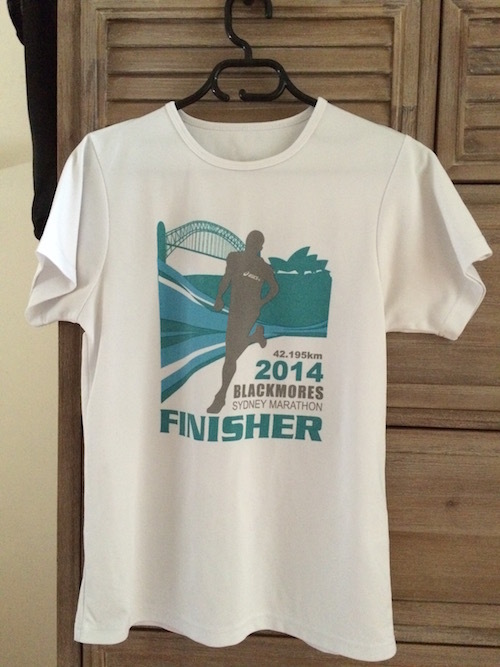 Now, the marathon shirt – a bit worn out and the print beginning to fade. I treasure this shirt so much I’m now economising it. I only exercise with it once a week. In our consumerist society we are encouraged to desire more and to buy more and frequently – things that we sometimes don’t even need, cluttering our homes and lives with mindless purchases. I haven’t read any research on the topic but my gut feeling is that people are not that attached to most of their possessions. They may get the high from these purchases but once the feeling is gone it’s just one more item in their already overstuffed drawer. I think if asked, most people would rescue from the flames things that have an emotional value to them rather than their latest designer jeans. My marathon shirt was hard earned. Lots of precious hours and hundreds of kilometres of training rain nor sunshine. There was also pain involved, specially the final two kilometres when my body was giving up and my mind kept me going. It was an amazing experience that has been hardwired in my brain. I don’t actually need the shirt to remind me of that moment but it represents for me a symbol of mission accomplished and a reminder that the mind is capable of great feats. What is your most valued material possession?